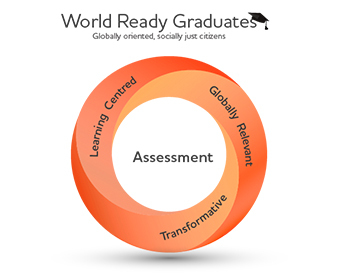 Assessment at ECU is principle-based and designed to develop world-ready graduates. Effective assessment begins with clear Learning Centred goals in a Whole-of-course Approach. This requires clear articulation and benchmarking the specific skills, competencies and conceptual understandings we hope students will achieve by the time they graduate (course learning outcomes), and designing opportunities to scaffold learning throughout the course. That means unit learning outcomes also need to align to the overall goals of the course and play their part in building students’ capacity to become World Ready Graduates. Feedback that develops students’ evaluative judgement is Learning Centred and Transformative. Effective and sustainable feedback encompasses a multitude of processes and practices, outlined in the How To guide below and further elaborated in the external link to Colorado State University’s Teaching Guide to Using Student Peer Review. For more information about assessment at ECU, please review the Assessment Policy and associated Assessment Examination and Moderation Procedure.